What Is The 10th (Tenth) Commandment In The Bible? What is the 10th Commandment in the Bible? Is this Commandment still in effect today? When Moses brought down the Ten Commandments to Israel, they had already broken most of them by the time he came down the mountain, but these commandments were not from Moses but from God, written by God Himself in tablets of stone, which signifies their permanence. Moses did bring some laws and these were the Mosaic Laws but even these weren’t his ideas but from God, however the Mosaic Laws were commanded only to Israel as you see often the attached statement, “Say to the children of Israel,” so these are not for us today because there are laws that prohibit us from sacrificing animals. These laws pointed to the coming work of Christ many thousands of years later and when Jesus came and died, He effectually nailed them all to the cross. Not so with the Ten Commandments. In fact, most of the western nations used the Ten Commandments as their foundation for society and so these laws are still practical and applicable today. Coveting is the only Commandment that you can’t really see from the outside, although God sees everything, including our heart (Heb 4:13), but when someone is coveting, you can’t see it. 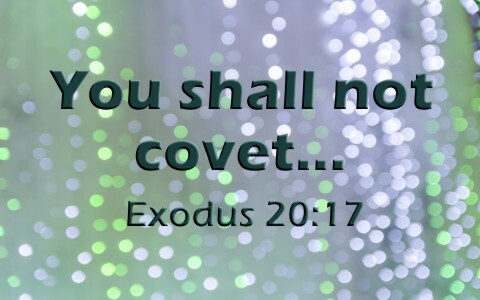 Coveting is essentially lusting after something that’s not yours and coveting was the one law that nailed the Apostle Paul as he wrote, “For I would not have known what it is to covet if the law had not said, “You shall not covet” (Rom7:7). Paul, as a previously meticulous Pharisee, was probably very obedient to the Commandments of God, but coveting was his own weak spot (as it is for us too). So by coveting, Paul said it was “sin, seizing an opportunity through the commandment, produced in me all kinds of covetousness. For apart from the law, sin lies dead” (Rom 7:8) and so “The very commandment that promised life proved to be death to me” (Rom7:10) and all of us for that matter. The problem was not with the law because “the law is holy, and the commandment is holy and righteous and good” (Rom 7:12). The Ten Commandments have us all standing before God as guilty and condemned men and women as we’re all lawbreakers by heart, as it “was sin, producing death in me through what is good, in order that sin might be shown to be sin, and through the commandment might become sinful beyond measure” (Rom 7:13). “You shall not covet your neighbor’s house; you shall not covet your neighbor’s wife, or his male servant, or his female servant, or his ox, or his donkey, or anything that is your neighbor’s” (Ex 20:17). In our society today, coveting might still be coveting our neighbor’s spouse but also our friends spouse, our co-workers spouse, or even a church member’s spouse, or even a position that they have in life (like a job), so it’s not just our immediate neighbor that God is referring to but as Jesus indicated; everyone is really our neighbor (Luke 10:36-37). Notice that there’s a lot more detail with this commandment than the other commandments in relation to mankind (5th-9th). We are not to covet or lust after our neighbor’s spouse (or anyone’s spouse) but also we’re not to covet their employees (slaves) or servants or their cars (donkey) or even their equipment (ox), and in fact, anything that’s our neighbors we are told not to covet. This included anything they have but also since everyone is our neighbor, we shouldn’t covet anything that anyone has. This shows God you’re not contented with your lot in life. It’s telling God, “God, it’s enough…I want more… I want what my neighbor has.” Obviously, this is not pleasing to God at all for He sends the rain (or blessings) on the just and the unjust (Matt 5:45), whether they deserve it or not. If you are tempted to easily covet your neighbor’s goods, just stop and think of this; is that man or woman saved? Will their possessions help them on the Day of Judgment? Of course not. Why covet their status in life when they are headed for the lake of fire if they’ve never trusted in Christ. Pray that they do. There are no shortages of things that we can covet today. We can covet a professional sports superstar and their talent and money. We can covet a person’s job like being a supervisor or CEO. We can covet a person’s home, family, car, status or any other number of things. Why is coveting so bad? When Paul was speaking about being nailed by the sin of coveting, the Greek word he used in Romans 7:7 was “epithymia,” which means “to desire, have a craving for, a longing or desire for what is forbidden” and even “lust,” so coveting is quite obviously a sin and one that begins in the heart and is not easily discerned in others and sometimes even in us. We are simply told not to covet and should obey this, even if we don’t know why. Now we have no excuse as we have read, but think about this; obeying God always comes first and often, understanding comes only after obedience. Just like a child is told to obey certain rules in the home, even if they don’t understand, they must first obey. In time, they will. This commandment is nearly impossible to see in others but it can be deceptive in us too. The heart is so desperately wicked that we can’t even know our own hearts, only God can (Jer 17:9), so ask Him to reveal to you when you are coveting others or other people’s status or possessions. Coveting is so easy to do but so hard to stop. Coveting is also lusting for things that are not ours and that God has deemed we don’t need. We can end up owning many possessions but they can also end up owning us and our hearts and can become a god to us, which is idolatry. We should be satisfied with what we have in life. A great way to defeat a covetous heart is to thank God for everything that we have because it’s hard to covet when you’re praising and thanking God for His many blessings, particularly the greatest blessing of all and that’s receiving eternal life by trusting in Him and His great Son, Jesus Christ (John 3:16). Previous post: What Does The Bible Say About Praying For The Dead?